Carbon dioxide is a funny molecule. Life as we know it wouldn’t exist without CO2. But when we pump too much of it into the atmosphere, it destroys our environment. That’s why the Clean Power Plan, announced yesterday by the Obama administration, has finally decided to call carbon what it is: Pollution. This comes over forty years after Clean Air Act legislation began curtailing other types of pollution, including airborne lead and ozone. Here’s why the EPA thinks it’s important that we start calling carbon pollution. Carbon is Changing the Climate, Period. You’re probably sick of hearing about it, so I’ll keep it short and sweet. Carbon dioxide and methane (also a form of carbon pollution) concentrations in the atmosphere are increasing. These molecules absorb heat that would otherwise escape the Earth, and that’s causing our planet to warm up, which is in turn causing ice caps to melt and sea levels to rise. Some of that extra carbon is also dissolving into the oceans, causing them to become more acidic and less hospitable to certain marine ecosystems. For thousands of years, atmospheric CO2 concentrations held steady at 280 parts per million. This past spring, we hit — and quickly flew past — the 400 ppm milestone. That means we — humans — have already managed to increase atmospheric CO2 by 42 percent. Millions of years ago in the Pliocene, CO2 levels also hovered around 400 ppm. At that time, the Earth was 2-3ºC (4-6ºF) hotter and sea levels 50 - 80 feet higher than today. Our planet’s ecosystems and species were fundamentally different. 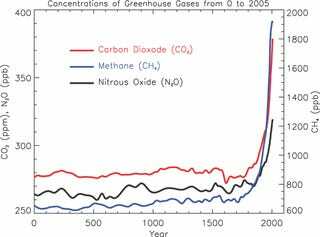 Atmospheric concentrations of important long-lived greenhouse gases over the last 2,000 years. Increases since about 1750 are attributed to human activities in the industrial era, via Co2now.org. The reason for the carbon spike in the atmosphere? Mostly, CO2 from fossil fuels used in transportation and power generation. Methane, which is produced in agricultural systems and natural gas extraction, is a much more potent greenhouse gas, but CO2 is the quantitatively bigger pollutant, accounting for 82% of greenhouse gas emissions in the US alone. A vast trove of scientific research supports the idea that anthropogenic carbon emissions are fundamentally changing Earth’s climate into something we’ve never experienced before. The IPCC’s 2014 synthesis report provides a good summary of the current science. Carbon dioxide may be essential for life as we know it, but too much of a good thing is pretty much always bad (even drinking water can kill you). Fortunately, when it comes to CO2 we don’t start experiencing acute health effects until we reach concentrations of 2-3% — and that’s a milestone we’ll hopefully never, ever hit. Still, carbon pollution does affect our health indirectly, because of the aforementioned impact on Earth’s climate. Warmer and hotter temperatures are causing heat waves and droughts. This summer, record breaking hot spells in India and the Middle East have led to massive power outages and thousands of deaths. In the US, fire and drought and more drought and more fire are sending massive plumes of smoke across the country, creating a health hazard for people with asthma and other respiratory problems. Warmer temperatures can also increase ground level ozone, a highly toxic pollutant. Even if you don’t give two cents about climate change, you ought to care about the health of your fellow human beings. And it’s undeniable that a hotter world with more extreme weather is a world less safe for humans. Yea, and so are lots of other EPA-regulated pollutants, including fine particulates (which occur naturally as dust), ozone (which occurs naturally in the stratosphere), sulfur dioxide (produced naturally by volcanoes and hot springs), nitrogen dioxide (produced by microorganisms and lightning), and lead (which is present naturally in the air, soil and water). Like all of these other pollutants, carbon is dangerous because we’re hiking the levels in our atmosphere way above background. Then, in September 2013, the EPA decided to pull out the big guns, invoking the Clean Air Act to regulate carbon as a pollutant. For the first time, the EPA proposed carbon pollution standards for new power plants built in the future. It also kicked off the process of engaging states and stakeholders to establish carbon pollutions standards for existing power plants. 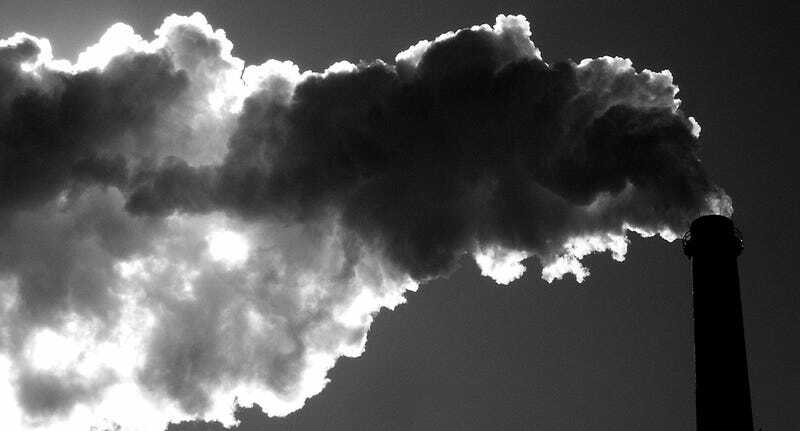 In June of 2014, the EPA acted under Obama’s Climate Action Plan to propose a first draft of the Clean Power Plan, which would regulate carbon as a pollutant with the simple goal of cutting said pollution by 32% by 2030. The finalized Clean Power Plan was unveiled yesterday. Each state is now expected to put together its own plan for curtailing carbon emissions, which will be approved by the federal government in September of 2016. You can learn more about how the Clean Power Plan will affect individual states here. With five of the EPA’s ten things to know about the new energy plan specifically focused on carbon pollution, it’s safe to say this is a term we’re going to start hearing a lot. But isn’t it all just semantics? We haven’t discovered anything new or revolutionary about carbon dioxide over the past five years — we’ve known of its global warming potential and health risks for decades. What we have learned, however, is that how we communicate about environmental issues matters a lot when it comes to making policy makers and the public care. Nobody gave a hoot about lead in the 1950s. Lead was in your pencils, your lipstick and your plumbing. Kids ate lead paint chips sometimes. Then, in 1965, a geochemist by the name of Clair Patterson discovered that lead concentrations had spiked in recent ice core samples, meaning there was a lot more lead in our atmosphere and environment than there used to be. He went on to conclude that the amount of lead Americans had in their blood was 100 times above natural levels. Other research began to show that lead was toxic. People started to get worried, and in 1970, lead became a regulated pollutant. The health impacts of lead are now well established, and it’s almost unthinkable that we would return to the days of putting lead in everyday things. But unlike lead, the impacts of carbon pollution on humans aren’t so clear cut. People tend to think of climate change as a planet problem, not a me problem. Only now, after years of unheeded scientific warnings has it become clear to scientists and policymakers that we need to make humanity’s carbon problem more personal. That’s why the most recent IPCC climate report didn’t focus so much on the well-established science — it focused on the human impact, from infrastructure and economic losses to health and poverty. And it’s also why we’re now calling carbon pollution. Pollution is something dangerous; something we don’t like. And — sorry carbon — but it’s in our best interests not to like you very much right now.